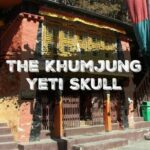 You are here: Home / Asia Travel Archives / Nepal / Fear and Panic on the Everest Trek. Scary Bridges! Fear and Panic on the Everest Trek. Scary Bridges! I’ve posted already about how much we loved the experience of trekking in Nepal’s Everest region, so don’t take what I’m about to say the wrong way. Just because I was scared half to death regularly and frequently by the scariest of scary bridges ( and the odd path with precipitous drops, mud slides and general precariousness) and just because I *may* have been reduced to tears once or twice (or three times), doesn’t mean I wasn’t having a good time. I love the mountains with a passion and I’ll be back in the Himalayas just as soon as I can, but that doesn’t mean it’s easy. Sometimes it’s scary. We are heading to EBC in 2018 and to K2 Base camp in 2019. Sign up to follow those adventures! My dear husband decided to capture my reaction the highest, worst, most terrifying of the scary suspension bridges in the Everest region. Just to clarify, we were on the Everest Base Camp trek but turned back just 2 days before Base Camp, we didn’t think it fair to take the kids any higher at just 9 and 11, so we did some lower side treks instead. That, and we didn’t have much by way of gear, hitting the serious snow in just running shoes didn’t seem so smart. 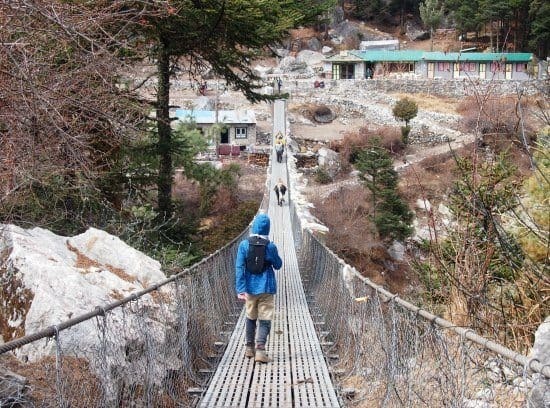 So if you’re heading to Everest Base Camp, or trekking in the Everest region generally, these are the bridges you will be crossing. There are several and I’ll save the worst, and the video of me mildly losing it, for the end of the post. Best Blog Read Now! 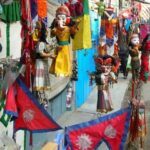 What is Nepalese Food Like? Nepali Foods to Enjoy. Would you save this to Pinterest for us? Just hover and click. 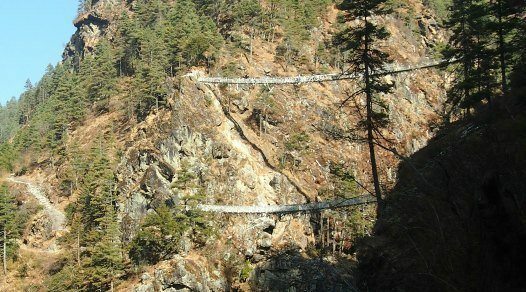 The bridge below was on day 1, as we descended from Lukla airport. As if the flight to Lukla wasn’t hair-raising enough. I coped petty well with this one, better than I managed on the Annapurna circuit 16 years ago. My fear of heights may have diminished with age. Oncoming traffic adds an extra layer of fear to bridge crossings in the Himalayas. I never had to pass an oncoming yak or donkey caravan ( thank GOD! ), we always waited until the way was clear. I’m scared of heights, really scared. I also suffer from anxiety, particularly where there is potential for my kids to plummet to their death in the melt waters of the Khumbu Icefall, so yes, I freak out maybe more than most. But I never let it stop me. To me, getting up those mountains is worth all the stresses and strains of the journey times 10 million, so I just get on with it. 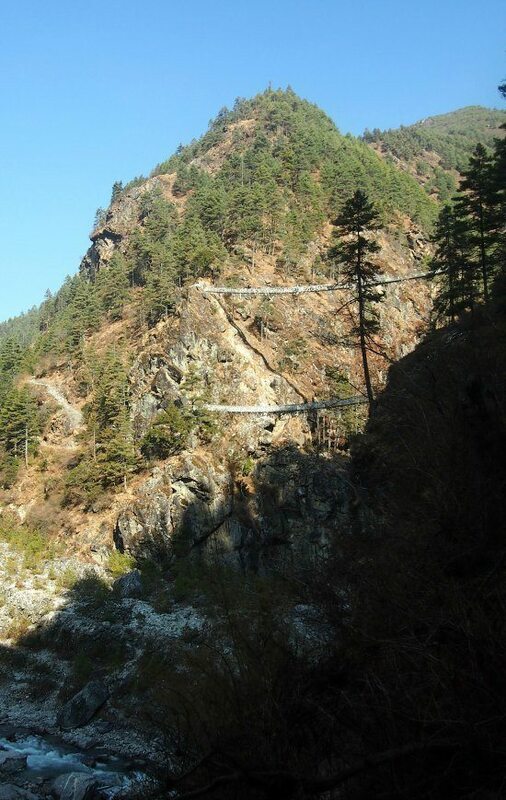 Here are some pictures of our favourite scary bridges from our Everest trek. The porters don’t care, they just march on, carrying everything from eggs to sofas up to the high villages. This one was pretty high, but it’s not the really scary one. 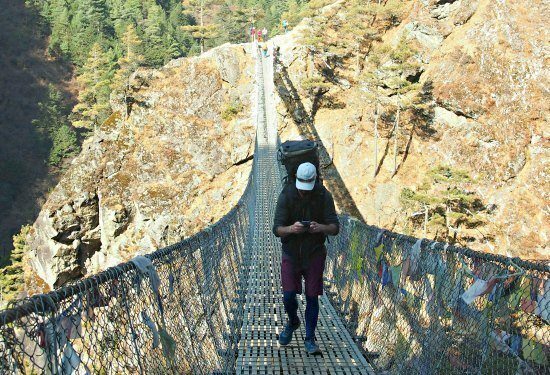 This bridge was below Lukla, we hiked out of the Everest region rather than flying. Down here you hit donkey caravan after donkey caravan. We waited at least half an hour for a window to cross without oncoming four-footed traffic. 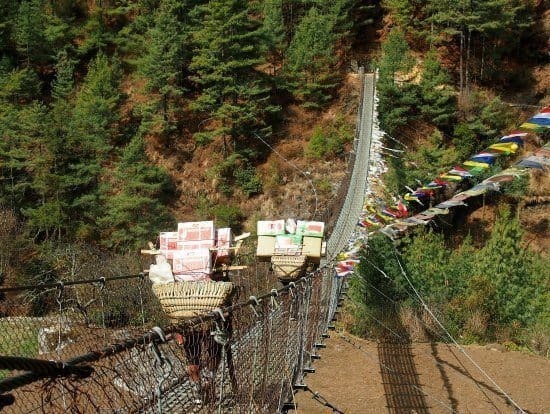 This bridge was on our mother and son bonding trek up to Tangboche Monastery. Neither of the kids were as worried by the bridges as me. D, my elder son, wasn’t bothered in the slightest. He’s never had any fear of heights. THIS was the scary one. Here comes Chef in his running shoes, fiddling with his phone because he just took a sneaky stealth video of moi. Doesn’t look too scary? Just wait! This is the big, bad, scary one. The scariest of the scary. This is the bridge from the movie “Everest” and this is the only bridge that made me cry on this trek. Can’t see clearly? Lets blow it up a bit. No, not the bottom one, that’s the old bridge. It’s the top one. The bridge you see in the movie Everest. It’s about an hour or two before Namche Bazar and on the way up we crossed it in driving snow and high winds. Yes, I shed a few silent tears before just….doing it. Yes, they bounce, with every step. And SOME people don’t give a flying one about those of us who may be terrified. You’ll also notice my deathly grip on the hand-rail. Sorry it’s poor quality, he only had his phone, but you can see how high it was. So would you do it? Could you do it? Are you just itching to do it? We’re heading to Everest Base Camp in 2018. If see anyone sobbing, it will be me. 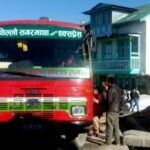 You might also like the post about the terrifying flight to Luka airport, or the even more terrifying bus ride from Phaplu to Kathmandu, if you feel the flight is too scary. I’m such a wimp. 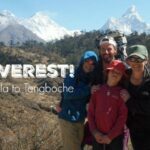 See our other Nepal content in the related posts section, bottom of the page and don’t forget to sign up to follow us to Base Camp this year, K2 in 2019.
for you, for Pinterest. Thanks! Great job on the trek. 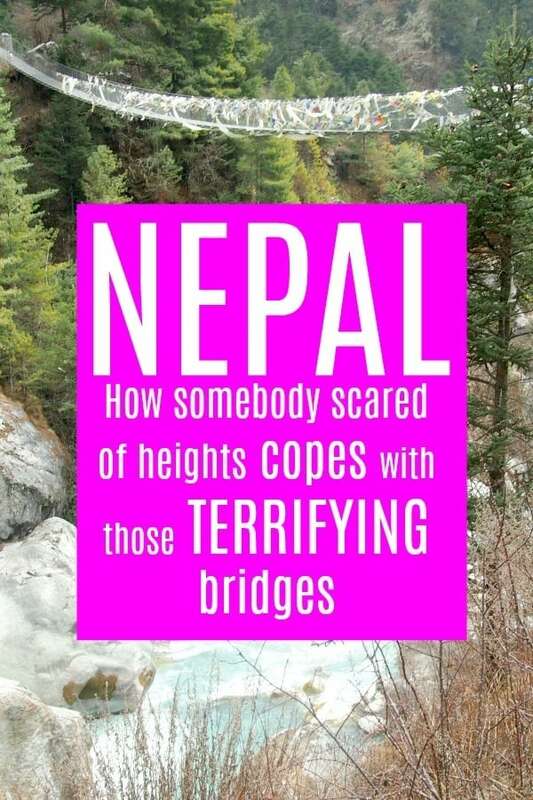 I too have a terrifying fear of heights but would really like to plan to do the EBC hike as my “retirement trip’, but am hesitant to consider it due to the bridges. 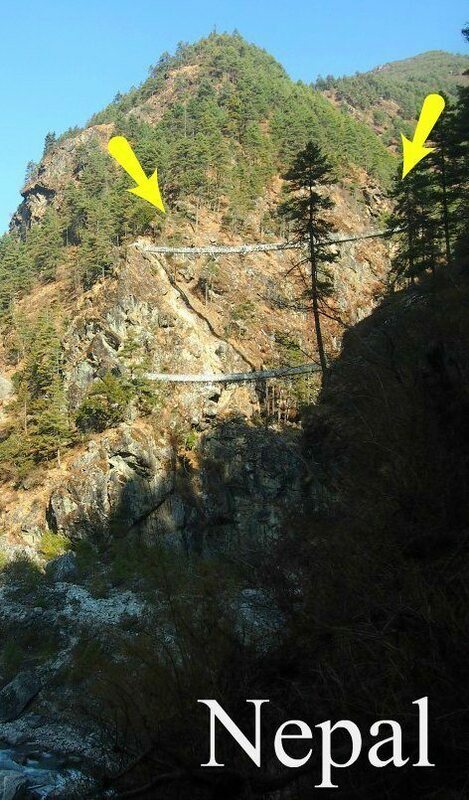 Just wondering — for the Namche Bazaar bridge that has the high & low route, can you actually still take the lower bridge if you ask the guide to go that way ? Any little bit of height reduction would help…. Let me know any thoughts you have on that..
No it’s closed. Sorry! You don’t need a guide either. It’s a very well worn path, just follow your nose. Or maps are good too, pick one up in Kathmandu for a dollar or two. Honestly, you will never meet somebody more terrified of bridges than me. If I can do it I’m sure you can. Sometimes I’ll sit and wait forever to be sure there will be no other people, yaks , cows or donkeys on a bridge, but I get across. The more you do the easier it gets. By the time you get back to that high bridge after hitting Base Camp you’ll be skipping over it. But don’t do the Gokyo Lakes trek, I’ve been warned off that one by a guide who is a friend, he said it’s very, very scary, precipitous drops from a narrow path. There is a small section like that on the way up to the main EBC path from Phaplu, but if you walk from Lukla you miss it. Wow! you are so brave to just go ahead and do this anyway. I liked your article as I felt the same way when we trekked AC. I held onto the rails while crossing a bridge and always went half frozen when encountering a narrow trail or drop off. I thought I was alone, always asked if I’m the only scared one crossing this bridges… I had fun even if its also hard to breathe and I will go back to do EBC. Thanks for sharing. This will be me.. I’m doing the trek soon and not looking forward to the bridges, but you can’t let irrational fears dictate your life. So like you I shall grit my teeth and pass over them as quickly as possible, and feel the pride in myself when I make it to EBC. At least I don’t have to worry about the children, your stomach must have been churning. Well done! Love that I can share this with the world and make people like you and I not feel quite so alone. Have a great trek! We’ll be there again in autumn now. Thank you for some honest words and pictures. I am from Denmark, where our highest hill is about 300 meters. 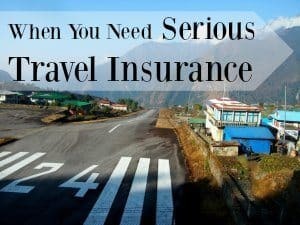 Right now I live in Thailand and plan a trip to Nepal. I’m seriously afraid of heights (and even felt the panic just looking at your pictures). As you wrote in a comment, you had gone down the mountain and up again to avoid a bridge. That’s something I could see myself doing. 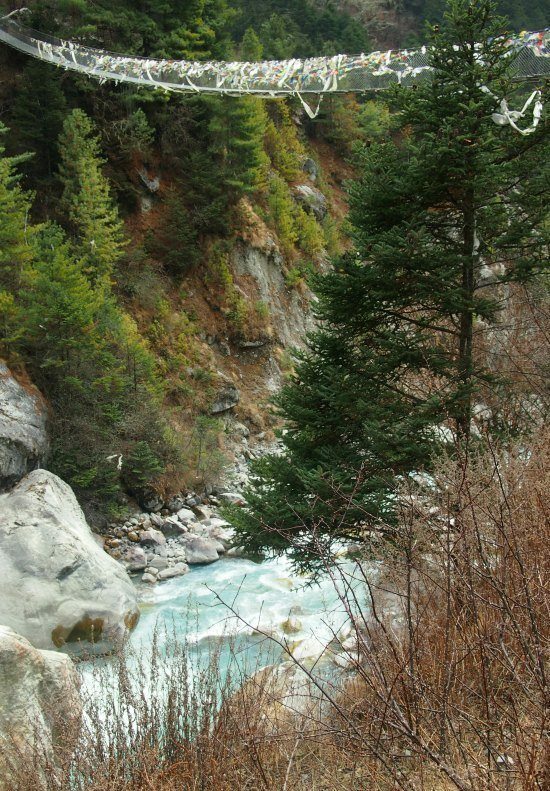 Therefore, I will ask you – it is better to take a trek to Anapurna(ABC) instead of Everest(EBC). I’m considering ABC as i find it very beautiful (not the circut – but “only” bacecamp). For me Annapurna was worse, that was the one where I climbed down into the valley to avoid a particular bridge. 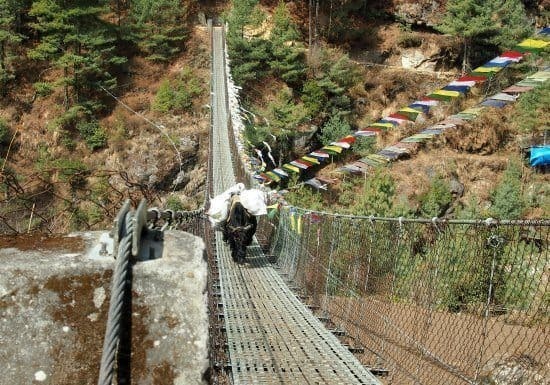 But there are a lot of bridges on the Everest hike and each one you do twice, going up and coming down. But you do, kind of, get used to them after the first few. 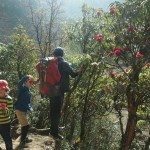 The worst part for us in the Everest region was the trek down from Lukla. Fly, that part of the trek is not nice. Seems you enjoyed a lot..! I wish I could also go on such places. But my fear of heights does not allow me to do so. I am a patient of Acrophobia, and just like any acrophobic, I just hate looking down from heights. But I am glad you had great fun. All those pictures look amazing. I am taking treatment for my phobia. Hope, I will also be able to enjoy adventurous trips like this, soon. Thanks for sharing your experience…! Oh my goodness Alyson. I hate heights, every muscle in my body is tense when I am up high. Well done. ???? OhMyGoodness, I would have freaked out! I’d like to think I’d still have been able to do it, but I would have been “eeking” and squealing the whole way across (and quite possibly running! That video was awesome! It kills me Lisa, absolutely kills me. I’ve just learnt to get on with it. 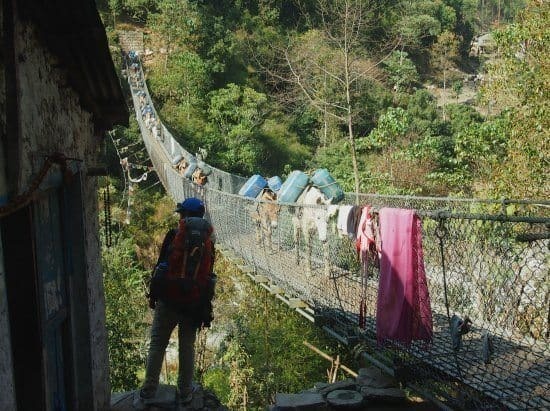 Once,on the Annapurna circuit back in 2001, I was so terrified of a particular bridge that I climbed down to the river and up the other side. I’m better these days. The worst thing….the possibility of meeting a yak or donkey convoy head on. They don’t stop, you have to squash up to the side. You were very brave, living up to your fear and just going for it anyway. I’m like your hubby, I’m not afraid of heights and would look down pointing things out and making comment! Our son is like myself and most children – they’re not scared unless you are! My husband on the other hand, is scared of heights and has motion sickness too, so if that bridge was swaying…. ‘Would love to do an Everest Trek one day. I’m not kidding myself though, perhaps just a part of it. I hiked up a live volcano two years ago and I cried all the way up ‘cos I thought it would be easy, and didn’t do much more than ride a bike to keep fit. I was grossly mistaken lol! You did really well and I share your frustration of people who seem oblivious or almost enjoy your suffering and making it worse. My big fear is cable cars and I will never forget going up in the tiny purple car in Langkawi and a feeling of accomplishment at doing it. Plus, you can feel more accomplished than those who have little fear as it’s easy for them and feel free to point that out to them ???? I’m a skier Carl, I’ve had to deal with cable cars or not ski. Another thing I just have to get on with! Life is very unfair in the phobia department. Luckily I’much better with spiders these days 😉 And well done you. We haven’t done that Langkawi one, we were only there a day. Next time! Wow, those are some scary bridges! I think you held it together very well on that last one, you really powered across at top speed 🙂 I love Chef’s nonchalant commentary and over-the-bridge shots! We would love to visit Nepal, now we’re returning to Asia it’s a real possibility. I think you did great as well. You faced the fear and did it anyway! That’s a huge accomplishment! I am a bit like Chef, would be looking around and enjoying the view but my hubby would likely not set foot on it at all. Wow, I think you managed great Alyson – just looking at it makes me sick … but yes, I’d go too, scared as hell, but I’d go. I refuse the cable-ways though (up Table Mountain or l’Aiguille du Midi) … I freak out before every flight as well, but it has never stopped me from hopping on a plane for travel. Yep, it’s like scuba diving, that scares the crap out of me, but once I get down there it’s worth it. The first leap is the hardest.